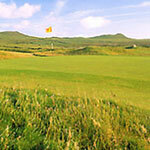 The features of this great links course are carved out of the natural terrain. The Old course has been the home to the West of Ireland Championship since 1895. Set right on the Atlantic coastline, Lahinch is exposed to the ocean through all her moods and has been molded and shaped over the centuries by nature’s harsh elements and an occasional touch of human genius. 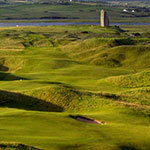 Formed in 1893, Lahinch’s undulating fairways and rolling greens measure a challenging 6,700 yards of true links golf. 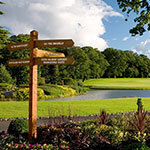 Dromoland is much more than just a golf club; visitors are free to avail of the many leisure facilities including gymnasium, swimming pool, Jacuzzi, sauna and steam room. The golf course is set within an estate of rich woodland around a huge natural lake and offers extensive views of the beautifully restored Dromoland Castle. Over the latter holes, expansive landscape views of the River Shannon complement the challenge offered by the golf course, while the River Rine also gently meanders its way through the estate. Jutting out into the wild Atlantic Ocean, with the 10th hole named ‘The Monster’, it’s no wonder that Waterville is considered one of the finest and most challenging Links courses not only in Ireland, but the world. Waterville has enjoyed great popularity and has hosted some of the world’s leading professionals from Faldo and Floyd to Stewart, O’Meara and Woods, all of whom have been captivated by the course. In almost continuous winds, this Par 72 and 7,725 yard treasure is a must for all golf enthusiasts. Every hole on the magnificent links at Ceann Sibeal has been carved from the natural landscape of one of the most remote and unspoiled parts of Ireland. 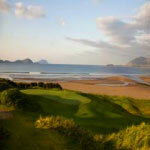 Located on the Dingle Peninsula, Ceann Sibeal, or Dingle Golf Club as it’s also known, is the most westerly golf course in Ireland and for that matter, Europe. The course is certainly the best-kept golfing secret in Kerry but at 6,690 yards in length, Ceann Sibeal is one of Ireland’s truly traditional championship links courses and is a real test of golf. 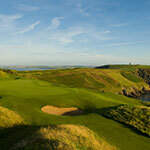 The Old Head Golf Links is quite simply one of the most remarkable developments ever conceived in the history of golf! The course rises hundreds of feet above dramatic cliffs, surrounded by the Atlantic Ocean on all sides and commanding the most spectacular views from almost every part. The nearby village of Kinsale is also renowned for its incredible culinary offerings and of course exceptional hospitality. Bring your camera as this round of golf will be hard to articulate to your friends and family back home. The old course is world famous and constantly rated amongst the worlds top ten. Designed by Tom Watson and Mother Nature, this awe-inspiring 6,638 yards links is a true test of golf. The newer Cashen course, designed by the legendary Robert Trent Jones, is also a gem and very demanding. 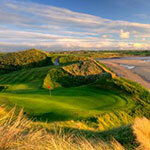 Ballybunion will not fail to meet your expectations. The course, designed by Greg Norman, was opened in July 2002. 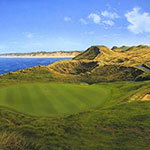 The course is located along a stretch of crescent-shaped beach and dunes, with the ocean visible from most holes. 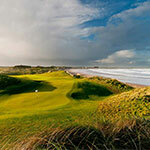 Measuring 6,818 yards, the links is a splendid experience for golf enthusiasts. Set on 230 lush acres of the Adare Manor Estate, Adare Golf Club was designed by legendary golf course architect, Robert Trent Jones Sr. and offers a magnificent parkland layout. 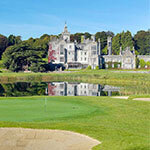 Adare provides a welcome respite from the different demands of links golf. While it always boasted a magnificent setting, with the course settling down and the greens thriving over time, Tralee has now joined the elite group of Irish links. With views of the Atlantic and white sandy beaches from almost every hole. 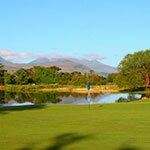 Tralee is one of those courses where it is difficult to concentrate on your game due to the breathtaking nature of the scenery but you will nevertheless note that the course offers countless superb holes. 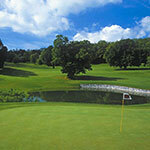 Fota Island had the honor of hosting the Murphy’s Irish Open in 2001 & 2002. Fota Island sits tranquilly in Cork Harbor, just a short drive from Cork City, which is Ireland’s second largest city. At 6,927 yards, this Par 71 parkland course is always in immaculate condition year round. Situated in area known as “Heaven’s Reflex”, due to its outstanding beauty, Killarney Golf Club comprises three top class parkland layouts: the Killeen Course, Mahony’s Point and most recently, Lackabane. However, it is the Killeen Course (closely followed by Mahony’s Point) that is perceived to be the jewel in the Killarney golfing crown. Nestled amidst the splendor of the Lakes of Killarney in the shadow of the majestic Macgillycuddy’s Reeks mountain range, the Killeen Course is consistently rated amongst the world’s top courses.